Phytophthora agathidicida is an aggressive soil-borne oomycete pathogen that kills New Zealand kauri trees (Agathis australis). When artificially inoculated, P. agathidicida causes lesions on leaves as well as roots, providing a non-invasive method for virulence screening. However, little is known about the extents to which the pathogen varies in virulence and kauri trees vary in disease susceptibility. Three isolates of P. agathidicida grown in culture were inoculated onto detached leaves from six kauri trees. Visible disease lesions were measured and the extent of asymptomatic leaf colonisation determined by culturing. All six trees were susceptible to P. agathidicida, but one showed higher susceptibility than the others. The pathogen also showed variability in virulence among isolates. Asymptomatic colonisation of leaf tissue was also found, suggesting a latent or biotrophic phase for the pathogen. 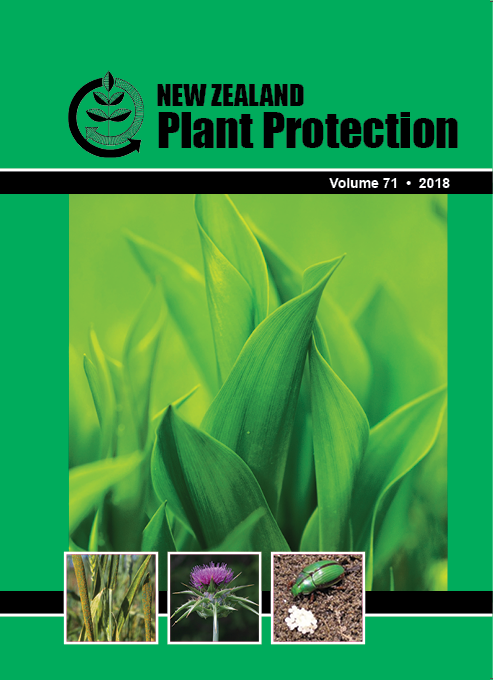 Although further work is needed, the variability of both pathogen virulence and host susceptibility have important implications for management of kauri dieback. Furthermore, asymptomatic colonisation of kauri tissues suggests that P. agathidicida could be present outside of regions with visible disease symptoms.